My baby daughter has a book called You’re All My Favorites, about three bear cubs whose parents tell them they are “the most wonderful bear cubs in the whole world.” But the cubs are smart and they doubt this assertion. How do their parents know? And moreover, how is it that amongst the three of them there isn’t a favorite? Some are big, some are little, some have patches, some don’t, two are boys and one is a girl. They are so different, how can their parents not like one of them better? Because there is a most wonderful first baby bear, a most wonderful second baby bear and a most wonderful third baby bear, their parents say. Where am I going with this? Bear with me (har har). Harry Potter is a first baby bear. He has wizards and wands and orphans (oh my!). But does every fantasy story henceforth need be second or third (or fourth) baby bear? What if they have wizards but no wands? Or orphans but not wizards? Or no wizards or orphans at all but just a boy with a scar? Or (egads) vampires? The answer, of course, is NO, they do not all have to be baby bears in competition. Therein lies my first point. 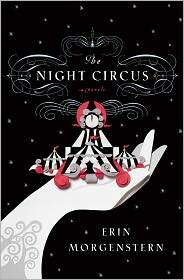 The Night Circus doesn’t HAVE to be the next Harry Potter. It can just the first Night Circus. This is not bad. This may or may not be good (I cannot judge at only 49 pages in). Which brings me to my second point. This book may or may not compare favorably to Harry Potter. But we should never burden an author with such expectations to begin with. So far, in my albeit humble introduction, I do not see any similarities between these two stories – besides the obvious. Except that word I’m beginning to dread – genre. It’s about wizards and magic, yes. But when you think about it, such stories have been around since the dawn of humankind. Sometimes it’s a summer blockbuster movie and sometimes we even call it religion. In the beginning there was the word and the word was magic. So as much as I admire and love Ms. Rowling, she didn’t invent wizards and wandlore anymore than Ms. Meyer invented vampires and brainless teenage girls. Which is a good thing, because it means no one owns the patent. We’re all allowed to use the blueprints. We can build whole cities of our imaginations without copying anyone. We don’t have to fight for Momma and Papa bear’s attention. We can all be the favorite. **NOTE I didn’t even tag Harry Potter in this post. I mean it, leave the poor woman alone.